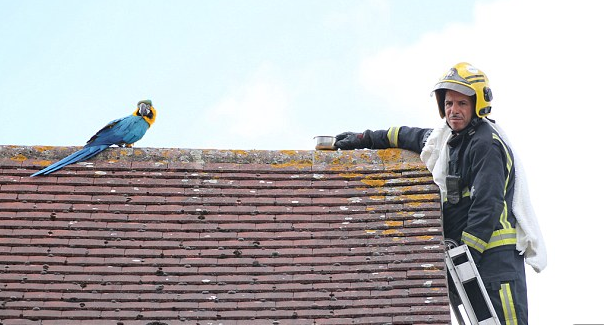 A “foul-mouthed” parrot launched a four-letter tirade at a firefighter as he tried to rescue the bird from a neighbour’s roof in north London. Jessie’s owner had asked for help after the multilingual Macaw parrot, which speaks Greek, English and Turkish spent three days on the roof in Edmonton. The RSPCA called in the London Fire Brigade (LFB) to rescue the bird. Crew manager Atinc Horoz climbed up a ladder to save Jessie but was met with a volley of swear words from the parrot, which then flew off. LFB watch manager Chris Swallow said Mr Horoz had told Jessie “I love you” after being advised it was the only way to “bond” with the parrot. “While Jessie responded ‘I love you’ back, we then discovered that she had a bit of a foul mouth and kept swearing, much to our amusement,” Mr Swallow said.